If you are a shooter looking to spend some time training at the range with one of the most popular calibers for self-defense, this 1000-round case of 9mm ammo by Federal is exactly what you need. 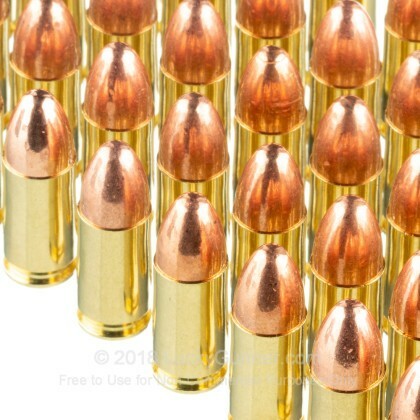 Outfitted with 115 grain full metal jacket bullets, these rounds produce a muzzle velocity of about 1125 fps with 323 of corresponding energy for a light kickback. These Federal Ultra cartridges have been assembled with brand-new brass casings and loaded with non-corrosive Boxer-primers and clean-burning powders. 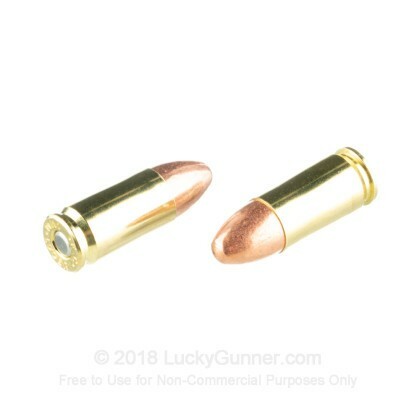 If you are a thrifty shooter who loves the added value of reloadable brass, these casings are reusable and perfect for handloading. For over 90 years, Federal has produced some of the most reliable and functional ammunition on the market. 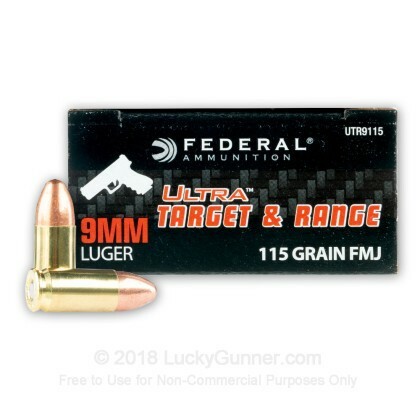 Whether you are using it for range training, target practice, or plinking, you can't go wrong with this 9mm Luger ammo by Federal. Order your 1000-round bulk case today! I've bought 1,000 rounds an no issues great ammo an great deal!!! Lucky gunner is the best ammo place. Cheap price an good quality always fast ship!!!!. Bought 1000 rounds of this a few weeks back. Already gone through 400 rounds in 3 separate pistols- no issues whatsoever. IMO, it's pretty clean shooting and I don't notice much residue or smoke when firing. Just ordered more! I shot over 600 rounds in brand new Sig 320 X5 and Sig P365. 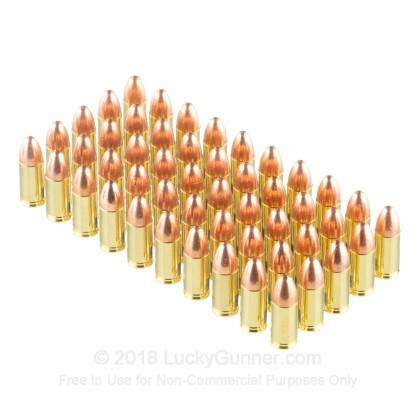 About 400 in this ammo and 200 in another brand. I had 3 malfunctions -- all in the other brand but 0 issues with this Federal. Very satisfied. Luckygunner's service and shipping are also among the best. Will buy again. This ammo is dead accurate out of my Glock barrel & KKM barrel.. I shoot it in Steel Challenge, it cycles fast and is very consistent..
Used on my brand new S&W M&P full size 9mm semi auto handgun and everything went nice! No misfire and I received compliments about the accuracy of my gun. A big deal of the accuracy is on the quality of the ammunition that you use in your gun. I am very pleased with this brand! 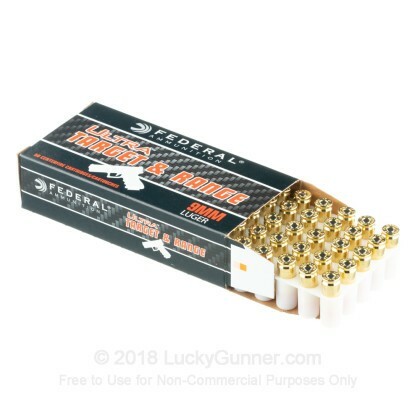 Great value for name brand new practice ammo. Good quality. Shoots clean with no failures in 1,000 round block. None of the worries that go with shooting remanufactered ammo. Excellent, clean shooting, no misfires. Terrific ammo. Working my way through a case and so far no misfires, really clean shooting. Gun stays really clean. Shot the full 1k rounds, no issues, fast shipping and well performing! I'm almost halfway through this and haven't had a single misfire yet. Ammo is performing great! Q: When applying for the rebate, do I use the rebate on the box, or the rebate on your website. A: Hi. You can either use the online registration process or download the forms to mail in at this site: https://promotions.vistaoutdoor.com/ Just click that link, then choose the brand name of ammo you purchased and then the actual product. That will get you to the rebate form and link if you prefer to submit the request online. A: The power factor for this ammunition would be around 129, give or take. You may be better off with a 124gr bullet. We also have this 9mm - 115 Grain FMJ - Federal Ultra - 50 Rounds ammo in stock in a smaller quantity.